Could It Be? Researchers Find A Hiring Bias That Favors Women : NPR Ed A new study shows that universities have a 2:1 preference for hiring women for STEM tenure-track positions. Think, for just a moment, about the last job you applied for. 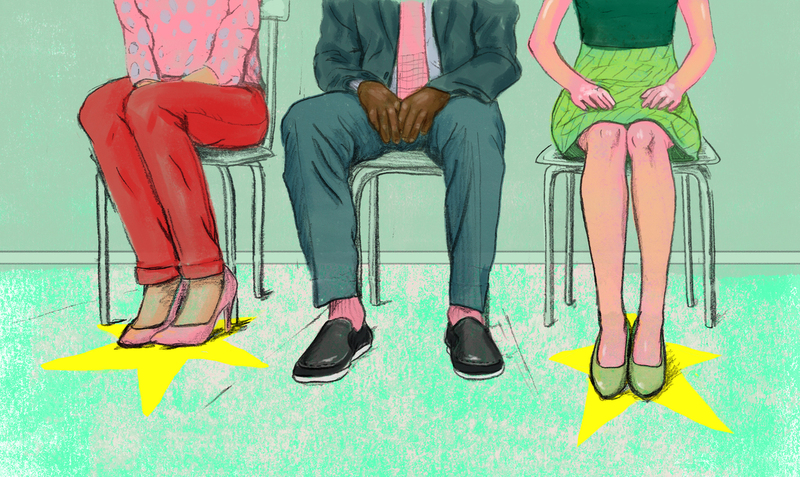 If you didn't get the job (apologies), did you get an interview? If not, did you feel some hidden forces, beyond your control, working against you? Perceived hiring biases against women working in science, technology, engineering and math have been around as long as women have been graduating from STEM programs. From 2008 to 2010, women received the majority of doctorate degrees in life and social sciences but only 32 percent of the open assistant professorships. Now comes a study that offers something of a counter-narrative — that, given the chance, universities would rather hire women for STEM tenure-track positions. The experiment at the heart of the study included 873 faculty members across biology, engineering, economics and psychology departments at 371 universities and colleges. Participants were asked to rank the profiles of three hypothetical candidates. Two of those fake applicants were similarly qualified and differed only in gender. A third, less-qualified applicant was included to disguise the intention of the experiment. Overall, the well-qualified woman ranked first 67 percent of the time. She was preferred over the similarly qualified male candidate in every field except economics, where the preference was evenly split. "To say that these findings were unexpected ... is an understatement," says Wendy Williams of Cornell University and one of the researchers behind the study. Here's why they were unexpected. In previous research, Williams had already found that women who apply for STEM faculty positions are more likely to be hired than male candidates. But she thought this was because the women who make it through STEM graduate programs have an edge somehow — more motivated, better pedigree, higher aptitude, etc. But Williams' new research suggests this hiring bias isn't just a preference for the stronger candidate. She found that, when a man and a woman had exactly the same credentials, universities still showed a 2:1 preference for hiring the woman. Even when the researchers took away participants' ability to make relative comparisons — by randomly assigning them to rate either just the man or just the woman — the female candidate scored higher. For once, it appears that men are getting the short end of the stick. "It's a provocative study," says Donna Ginther, professor of economics at the University of Kansas, that doesn't replicate the real world. For starters, Ginther says, employers don't decide whom to hire just by looking at an application. A candidate who's average on paper can win the room with a great interview. Likewise, a candidate can check all the right boxes on paper but fall short with a flimsy handshake. This study, published in the Proceedings of the National Academy of Sciences, captures the most frustrating — and mysterious — phase of the hiring process: When an employer sifts through hundreds of resumes, trying to decide who should get an interview. Yet this mystery remains: With lots of women now earning STEM degrees and schools apparently eager to hire them into tenure-track jobs, why do so many women simply not apply? If the answer is, because of a long-held belief that women in STEM don't get equal consideration, then this research should be a wake-up call.